Looking for information while you are performing due diligence on Guided Imports from Guangdong China who sells Sourcing Agent? If you’re looking for information on this company then read the below experience of one buyer who ended up having problems with this company. 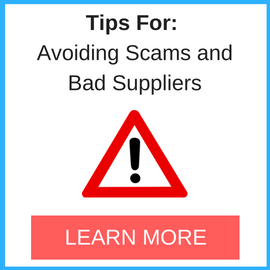 You will also find some links to help you find more related information about Guided Imports on Supplier Blacklist and on Google as well as other bad suppliers of Sourcing Agent reported here on SBL. I want to give you my full perspective on the issues i faced with Guided Imports “A-Z” service, which included: Feasibility Study, Supplier Sourcing Sample Consolidation, Negotiations, Managing the Production, Shipping & Logistics, Quality inspection, Dedicated Project Manager, and general guidance on the Chinese side of a importing business. I took this service in order to LEARN from the “experts”, but also to avoid unnecessary risks and costs. I wanted to have the best possible experience recognizing my lack of know-how of the process, as this was my first importing adventure. #1. Samples shipping: Whomever responsible to send me the samples did not sent them with the correct customs label/form, which was clearly confirmed by Brazilian customs agents in both attempts to send me the samples to Brazil. Moreover, before Guided Imports shipment, and after too, I’ve been receiving plenty of Chinese merchandise without any kind of issue, straight to my door. And that’s because they used the correct custom label on the package (very different with the one I’ve gotten with Guided Imports samples package). I have official records and also photos showing this fact. This issue caused me more than 3x shipping costs, almost 3 months delay in the whole process, and a lot of time spent in communication/investigation with local customs agents. I managed to solve this issue by asking guided imports to send me this samples package to my US address, and then i managed to bring the case to Brazil by myself. #2. Supplier selection: after almost 3 months of frustration with the sample shipping problem described above, when samples finally arrived to Brazil i was deeply disappointing with their quality. We only asked for samples that were scored as “good” and “very good” by your team, but they still were far below my expectations.. This issue frustrated me particularly because one of the main reasons i enrolled on a-z service was to make sure that i could get the best quality possible. Finally, i ended up searching and evaluating myself for a better quality supplier, and i found it. #3. Time & money spent: the other main reason to enrolled on guided imports service was that it was supposed to save me time and be cost effective (as it would allow me to invest my time on other aspects of my business). Needless to say, i have lost way more money and time working in behalf with G.I than i would do by myself alone. The full service was meant to last no more than 3 months. It finally took 13 months. #4. Communication: perhaps this is the worst problem of all. When i got myself convinced that there weren’t any kind of sense of urgency from Guided Imports side, i decided to do the work myself. So i reached out the supplier and put the order directly. Thanks to it, things started to progress, and now at least i have a due date to receive my goods, with a supplier i had pre-selected MYSELF. Even doing by myself all the work that the agent was supposed to do, i asked him to get in touch with the same supplier agent just to formalize the terms of the contract (purchase agreement and production manual). This didn’t happen until after 2 weeks, when i received a “draft”. Summarizing, so much time (my order started on December 15th, 2017 – today is 11/01/2019), and money wasted, even higher opportunity costs plus unnecessary headaches is the final balance I’ve got from this whole experience with this company. I’m sorry to say that Guided imports service has not delivered any piece of value for me. Its not a matter of one error or two or three. This company and this service has consistently showed me that they doesn’t value my business at all, and i had lost so much to win anything by choosing them as a key partner for my business. Of course, i’ll won’t work never ever again with them, and i don’t recommend Guided Imports to anyone i know. My advice: RUN AWAY from them. Need More Info on Guided Imports? 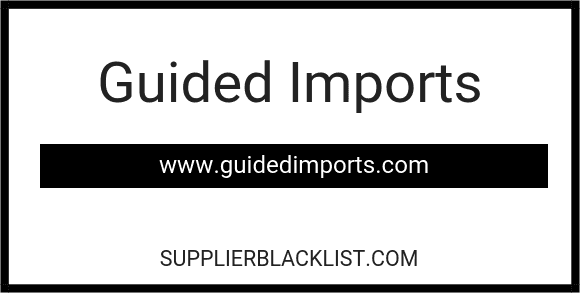 If you need more information, you can click the below links to search for more submissions about Guided Imports on Supplier Blacklist as well as go to the search results page on Google for more reviews online about this company. 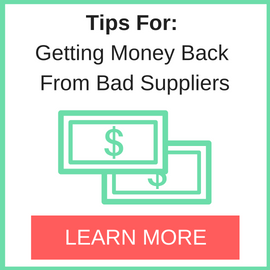 Perform a Supplier Blacklist search for more reviews on Guided Imports. Search Google for Guided Imports Reviews.